The Yerasov 5000 Volt Modern Distortion in rugged aluminum housing provides official nu metal high-gain sound and offers the following control options: Current (Volume), Insulation (Tone) and Voltage (gain). Power is supplied via the optional AC adapter. Verified. Works well and has good gain. To give this pedal more body bass I increased the 22nF cap between Isolation 1 and Current 1 to 47nF and am now happy with the tone. I recently built this with mixed results. While the pedal works well with gain up to about 3 o'clock on the dial, when it is maxed out to 4 or 5 o'clock, there is a whistling noise coming from the pedal which is not feedback and cannot be stopped unless you roll down the gain or volume on your guitar. I opened the pedal and observed that the two red LED diodes are both lighting up when this happens. So put another way, when the gain is full, it seems those diodes are getting signal from the circuit (and getting overloaded) even when I am not playing. Any ideas anyone? I used all new parts from Tayda and Small Bear, and double checked values, so the problem is not there. Pedal works fine with the exception noted above, and the soldering is clean, so I don't think that is the issue. Could it be a bad cap (even though they were all new)? 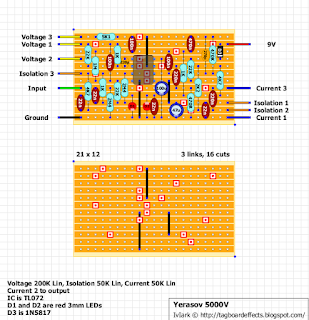 I could try switching out op-amps as I believe I another dual channel handy. Any difference between the 3mm LED specified here and the normal 5mm LEDs I have successfully used on other pedals? 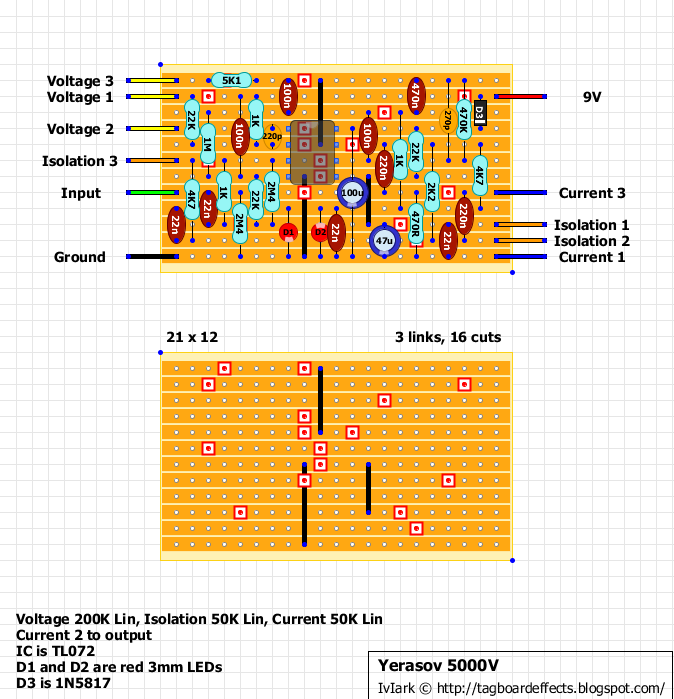 Alternately, could cap/resistor values need tweaking in the gain/feedback loops of the op-amps? Not sure where to start debugging this one. Thanks for any insights. Just FYI - this problem turned out to be opamp oscillation due to proximity of the input jack, input wire, and the 3pdt switch inside the box. Some research indicated that high gain pedals are prone to this problem - and a key symptom of opamp oscillation is the LEDs lighting up when no signal is present! I was able to solve this problem by rotating the switch & the input jack, and ensuring the input wire was out of the way of other components (as best as possible). Best solution would be a bigger box and better lead dressing on my part. Pedal now functions 100% (so circuit verified and perfect), but the overall result is a bit disappointing compared to other distortion units. This unit has a flubby bass response, and falls apart when playing low strings on high frets (a telltale sign to me that you're not using a tube amp). It sounds very good to me! I tried the 47nF as recommended, and I tried it 22nF standards. I finally decided to omit the caps, and for me it sounds better. I also increased the caps value which is between Voltage 1 and pin 4 of the IC from 100nF to 120nF. Great nice layout! Thanks Mark!